Like most kids I collected various things throughout my childhood, including buttons and pins. Most of my pins were from family travels, my parent’s political involvement in education, or participation in school events (see the full array here). Ramblin’ Rod would not have been impressed, but it was my collection and I was proud of it. A few buttons and pins were collected of my own volition, and one of my prize pins was found in a deserted lot near my home around 8 years of age – a unicorn with gold metal accents and a multi-colored mane. Between childhood activities of building forts out of firewood stacks and popping tar bubbles on recently repaired roads, finding a monogram unicorn pin was a highlightable moment – even if it had a G on it instead of an M. Many days I wore this pin and thought “if only my name started with a G”. Alas. Here are a few favorites from my childhood collection. So, it seemed destined that one day I would participate in a group art show called Pin That Sh*t during Design Week Portland 2017. Over 60 artists from around the world donated pins, all of which will be for sale with funds donated to support arts education. Once I learned I would be a part of the show, I revisited my 1980’s collection and started on designing something new for the show. My brainstorming ran the gamut from textures to animals to random icons. 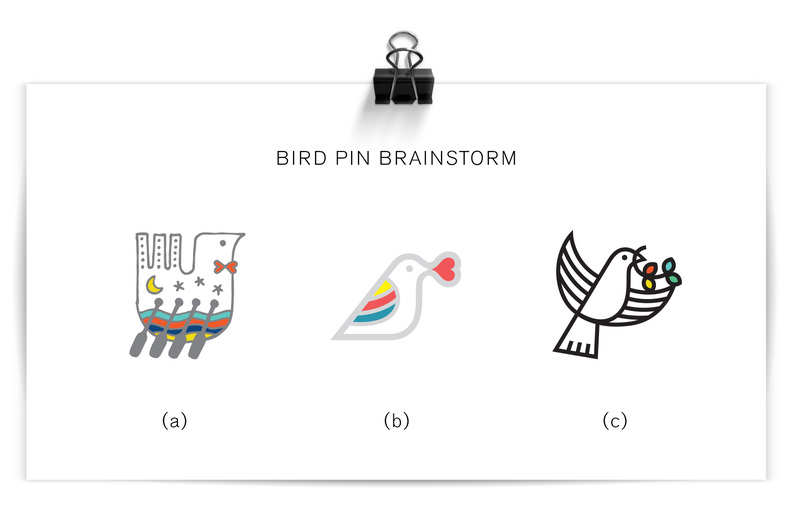 A theme of birds became apparent which guided a more specific exploration of several bird pins, of which the top three were considered for the final piece. 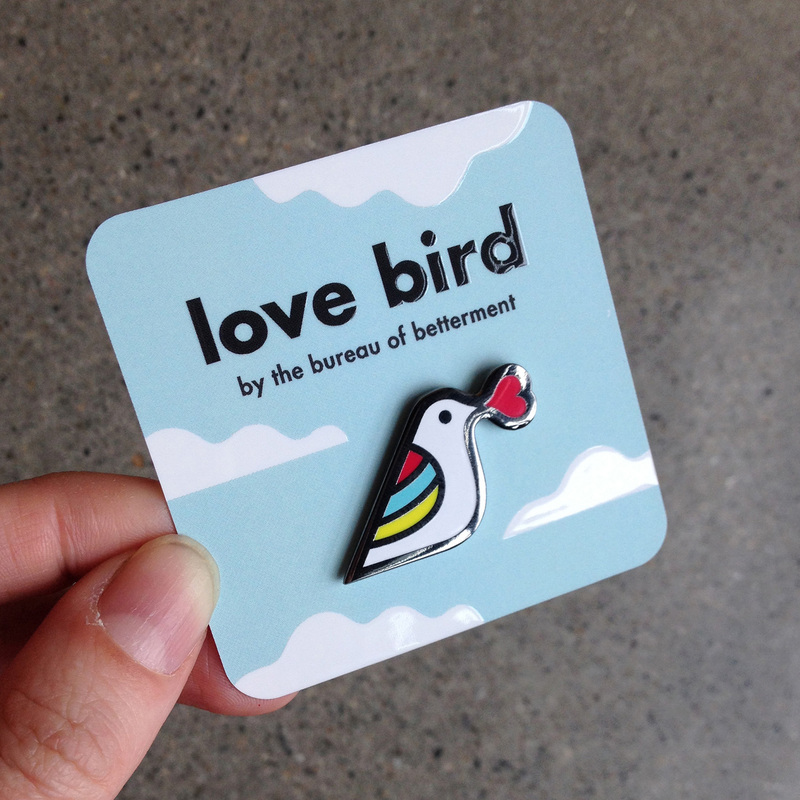 After feedback from studio mates, the simplest bird was adjusted to have bold black outlines, taking inspiration from my childhood unicorn pin but modernizing it in style. And really, what better way to converge ‘put a bird on it’ with the new hip trend of pinning everything in sight? Love Bird is a tiny yet highly visible fashion partner to any wardrobe or backpack choice. With a nickel metal detail and flat polished surface, its minimal design seeks to spread love and acceptance. It’s a bird with a meaning, but it’s also just darn cute! 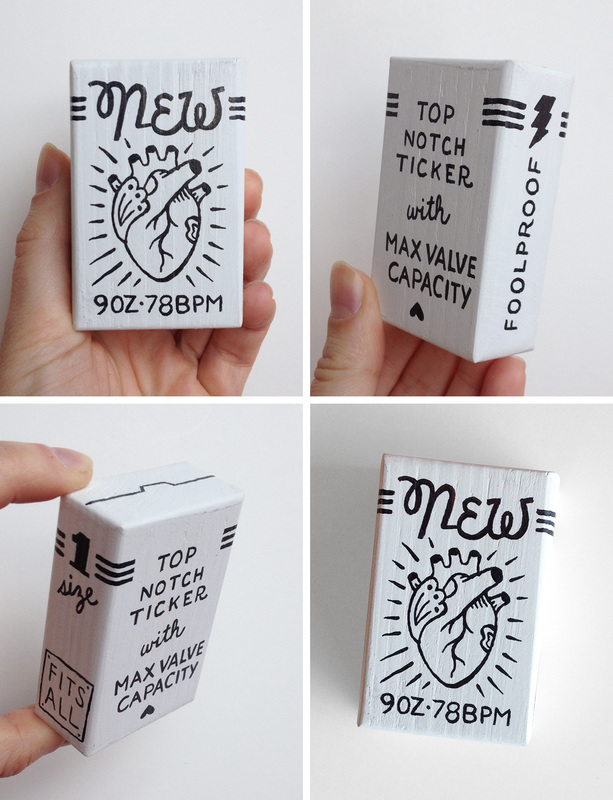 Two larger collections are also a part of the show from Kate Bingaman-Burt and from Brian Stowell, and many artists donated more than one pin so that there will be over 600 pins on display. For a more comprehensive list of artists and their bios, visit WeMake’s event page. The pin was produced through GS-JJ who make custom pins, patches AND belt buckles. 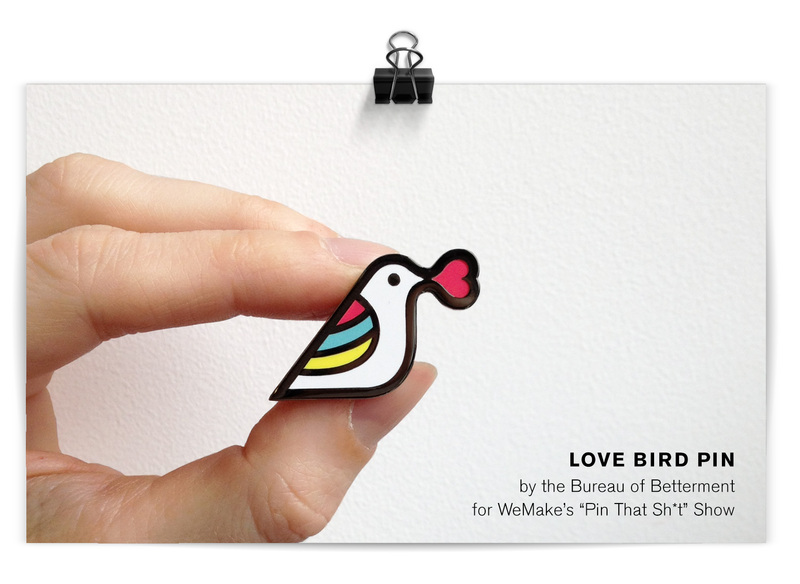 To transport/display the love bird pin, I ordered custom cards from Moo. A square, rounded corner card with spot gloss on the title and white clouds was the perfect fit for the bird with both shiny and matte surfaces. 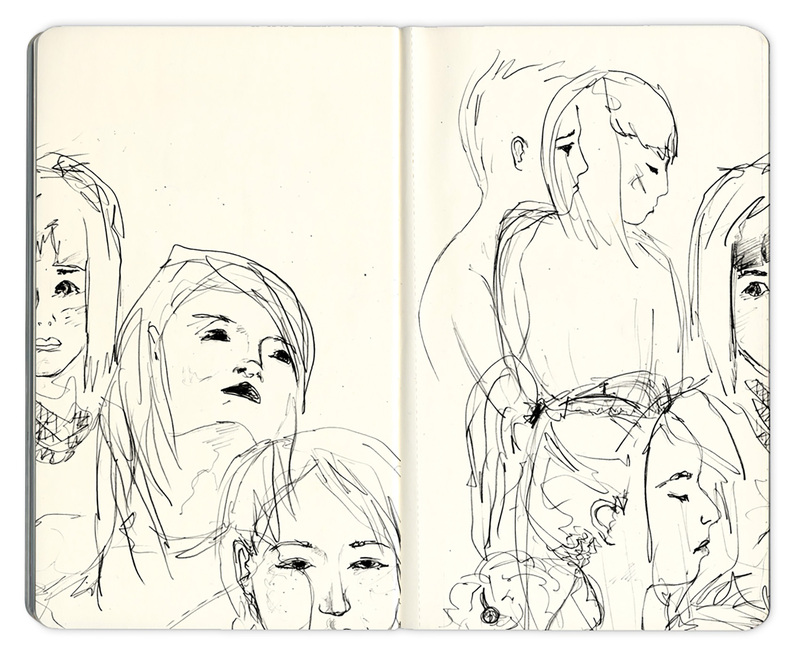 A new directory of women illustrators popped up on the internet recently, so I drew a portrait to be included. 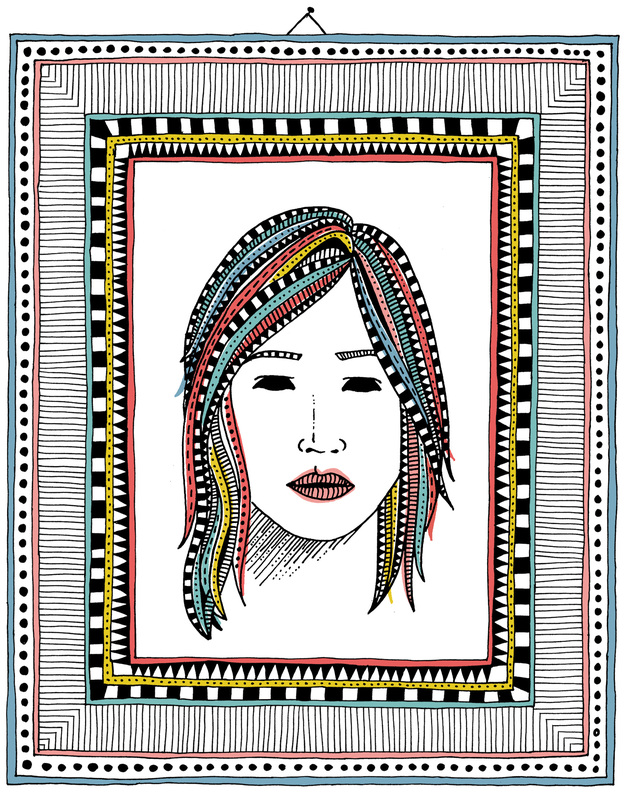 Visit www.womenwhodraw.com to see a glut of awesome illustrators (and hopefully my submission soon! ).